The Sunshine Coast Hinterland is rich in native plants and animals because of its diverse landscape, high rainfall and areas of high fertility. It is home to coastal wallum heathlands, rivers and wetlands, paperbark forests, eucalypt forests, rainforests and mountain heaths. Just within the Sunshine Coast Council region there are 84 different types of native ecosystem. This great diversity of habitat is home to over 1,600 native plant species and over 700 native animal species. It is a national ‘hotspot’ for diversity of native plants and animals. However, there are serious threats that affect the survival of many of these native plants and animals. 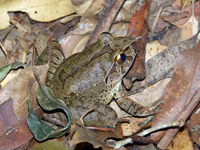 Both historical and recent clearing of bushland has reduced the extent of habitat available. In the Sunshine Coast Council region less than 42% of the original native bush remains. This clearing has selectively removed the types of ecosystem that lived on the most fertile and well-watered areas such as the valleys and floodplains, and areas of rich volcanic soil. In addition, ecosystems that live on the coast have been largely removed as urban areas of the Sunshine Coast expand. This has had a serious effect on animals and plants that rely on these ecosystems. A lack of connectivity between remaining habitat areas exacerbates the problem. Adding to the effect of habitat loss are the changes to remaining bushland, particularly through the invasion of noxious foreign weeds, such as Lantana, Privet and Morning Glory vine; and feral animals such as deer, feral pigs, cane toads and cats. The result of these changes is that many species and ecosystems are in decline. In the Sunshine Coast Council region, 44 of the 84 regional ecosystems are considered to be vulnerable, particularly those that occur close to the coast. In this same region, 91 plant species and 68 animal species are listed as Endangered, Vulnerable or Rare in Queensland and many are threatened nationally. These threatened animals include species little known and rarely seen such as the beautiful, exotically named, but hard to see Three-toed Snake-tooth Skink, Plumed Frogmouth and Long-nosed Potoroo. As well as somewhat better known species such as the Sooty Owl and Koala. Protecting these threatened habitats and species is a high priority for the work of Hinterland Bush Links. Many are found largely on private land. You can help by protecting and extending wildlife habitat to favour animals and plants that are under threat of extinction in the Hinterland. Even protecting or creating small habitat areas on your farm or house block will help. © Photo by Tony Bright, "Giant Barred Frog"